The link with chronic inflammation and cancer has been recognized for certain cancers for several decades. However, only recently has the biology of chronic inflammation begun to be understood, to the point that it may play a major role in tumour development. 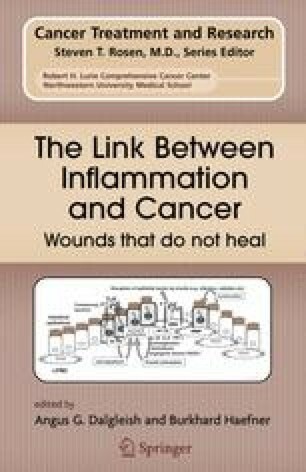 The biology of chronic inflammation has many similarities with that of wound healing. In particular, local cell mediated immunity is attenuated and angiogenesis is increased along with other growth factors. When present long term, this provides the ideal environment for mutated cells to be nurtured and escape immune surveillance. It is of note that this process still appears to take two or three decades, as witnessed by the close association between chronic ulcerative colitis and colon cancer as well as chronic hepatitis and hepatocellular carcinoma. Closer study of the inflammatory pathways show the close interaction with apoptosis and antiapoptotic pathways, as well as the main tumour suppressor genes, such as p53, as well as a number of growth factors, such as the insulin-like growth factor. A full study of these processes reveals that there are key molecules in these pathways which may provide therapeutic as well as anti-inflammatory targets.